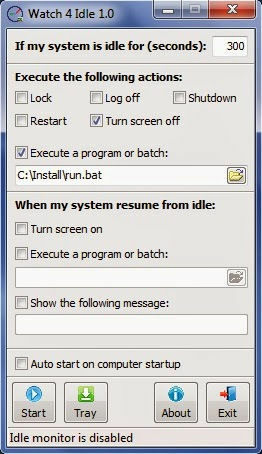 Watch 4 Idle is a tool that can wait for a computer to be idle to carry out tasks, like lock, restart or shut down. The main window is split into two sections, one dedicated to actions when the system is idle and the other for system resume. The idle time can be input by the user and is expressed in seconds. When the PC is not used for a number of seconds, you can lock, restart, log off or shut down the system, turn off the screen or run an app. In both cases, this software utility supports EXE, BAT and VBS file formats. This application could be very useful for those that often have their computers carrying out intensive tasks for a long time while they are away.